JustNeem is a small skincare company based out of North Carolina that is quickly becoming a favorite in our household. My fiancé and I both enjoy their bar soaps, lotion and body scrubs – all of which include a common ingredient, neem extract. 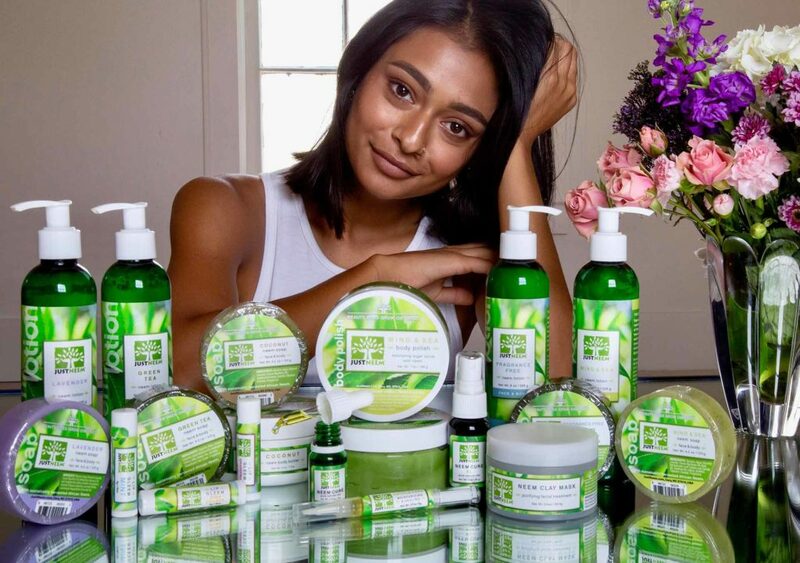 Because we’re firm believers in JustNeem’s products, ethics & values we wanted to interview their team and give you a chance to learn more about the founders, their products and how JustNeem came about. We spoke with Leslie Huffman the Director of Marketing at JustNeem. The owners of the company are Magda & Peter Radtke, PhD Chemists from Germany. How did the idea for JustNeem come about? In 2006 Peter went on a mission trip to Mauritania, W. Africa. He was confronted with extreme poverty (Mauritania is one of the poorest countries in the world). Neem trees were growing wild there and people living there had no idea about the medicinal value this magical tree possessed. Peter wanted to utilize the tree’s oils and leaves as a way to sustain a profitable environment for the people there. Magda, already a hobby soap maker, said: “I could use all of this for soap making.” In 2007 the company was then born from this idea and we began to build our JustNeem orchard along the Sahara desert of Mauritania were we farm the trees with local farmers and then ship to leaves and oil to the US to make our products. How did you choose the name “JustNeem”? Just (stands for justice) Neem (because we are all about the Neem Tree and its benefits to people and the planet). We make all natural skin care products that all contain Neem from our orchard in Africa. How do you select which ingredients to use? Is there anything in particular you avoid? 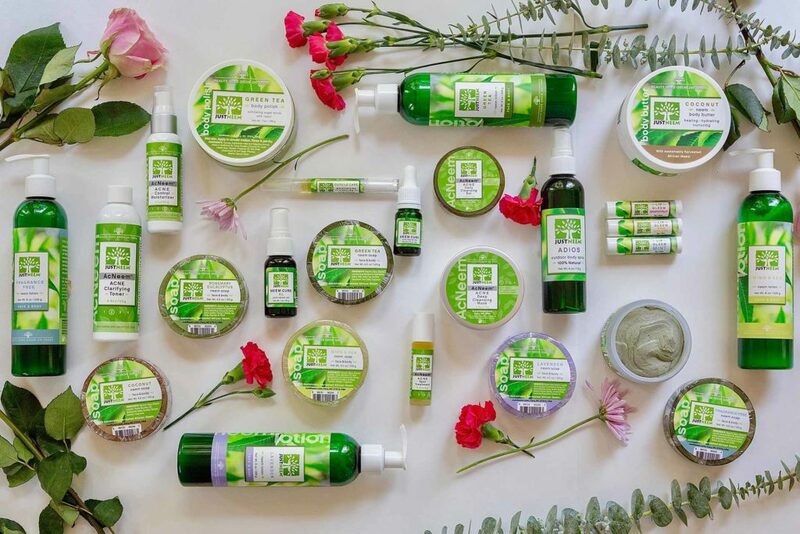 We absolutely are sulfate and paraben free, cruelty-free, use all natural and organic oils, botanicals and other natural ingredients that are highly effective for skin and are cosmetic grade. How do you select the scents, colors, and packaging for your products? Do you pull inspiration from anywhere? Everything we do is inspired by the magical Neem Tree itself. Our packaging and labels use the color green and photos of the neem leaves. Our logo also represents our deep connection with the Neem Tree. One thing we do wish for is more affordable clean packaging options for small companies like ours. We keep looking into better eco packaging options for the future that do not cause us to pass a large price increase on to our customers. As packaging options come down in price, we will make this a priority. What was the first product you created? Are you currently still making it? Our first product was Neem Soap. We still make a variety of Neem Soaps but I cannot remember the first one! We have changed and upgraded our formulations to cut out parabens and added more organic ingredients. Since our first days in 2007, many things have changed and there are so many new wonderful natural ingredients out there. We look forward to adding new products utilizing all the latest science. That is a hard question. But, I would have to say that our Neem Cure Oil is my favorite. It was our first signature product and it has so many beneficial properties and can be used as a facial treatment oil, first-aid oil, acne treatment, for eczema, burns, stings, rashes and more. Why is being cruelty-free (not testing on animals) important to you? First of all, we do not have to test on animals, so why would we? Our formulations are ethical in every way. Our principles are all about respecting and utilizing nature’s gifts without harming the environment. We try and live this every day. Do you offer any vegan-friendly products? All of our products are vegan except for our Green Tea Soap. It contains a small amount of milk. Do you have any new products or exciting updates in the pipeline? Yes we do! Hopefully we will have a new release this Spring. Receive 15% off of your first JustNeem order by using the code “CleanCrueltyFree15″ at checkout. We will have full reviews of the JustNeem products we’ve tried soon! Stay tuned! Disclaimer: This post is not sponsored. All opinions are our own. Nothing stated above should be used in lieu of professional medical advice. *We have no scientific data on these claims.